- Communicate everything very, very clearly to all participants up front, not just the family member who is booking. - Online gallery of images, heavily watermarked, very locked down. Gallery included: very blunt and clear explanation of copyright in the gallery, digital wall samples, digital album mock-ups, and digitally created collages. - A set date with password protected access for 24 hours to view the online gallery and make purchases. Orders after their chosen 24 hour period had a $295 relisting fee. - Four different extended family sessions. Largest family was 6 households together, smallest was three households. No participants were in my state. - Individual session fee for each household ($200/ea). The theory being that each family would be invested in the outcome if they each invest in the session. - In person Skype or In person studio sales sessions afterwards with each family, with slideshow, and screen sharing in order to show them their own wall art. - Four different extended family sessions. Largest family was 8 households together, smallest was 2 households. Only two households from two different sessions were in my state, both opted for Skype instead of coming in "because that's what everyone else is doing"
- The large family group shot was usually purchased as an 8x10 print by each household. The policy of a regular session fee for each household (even though each household is getting less of my time compared to an individual session for their family alone) did indeed help improve the engagement and participation of the entire group! This also helps cover my overhead costs (assistants, second photographers etc) compared to the days when I would charge a single $200 session fee for the whole group. While I was better able to help families choose between images, and did see a couple wall art sales because of the IPS style consults afterwards, the differences between the two models is not significant enough when you consider the extra time I spent on it. This was a huge surprise to me. Model A provided me with the most profit and security of income because of the large upfront cost, it also deterred 8 other families who felt the cost was too much. 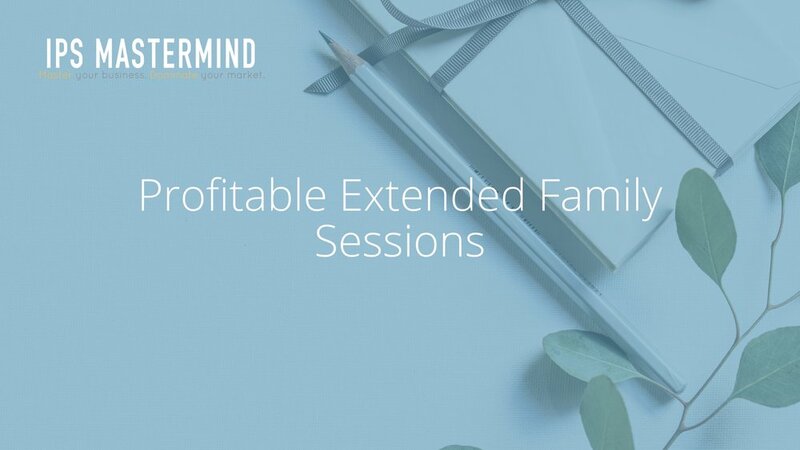 Ultimately I think that is a good thing, because many of these extended family sessions have resulted in sky-high expectations for too little compensation. Neither model resulted in sales that compare to my regular family sessions. I can't say that I love extended family sessions any more than I did last year, but I am glad to see that I was able to make some significant changes over previous years. If I continue these in the future, I will stick with a large up front fee in advance. Hope this helps others, and would love to hear from others who can make this type of session work in their favor! Tips and other experiences welcome.